Staying in an extremely cold country with plenty of snow, and not having a garage to park your car away from the elements? Chances are your windshield will be covered with a layer of snow or ice the next morning. Instead of scraping it off in the bitter cold while cursing your luck on your geographical location, why not check out what the Electric Windshield De-Icer can do for you? It melts both frost and ice away in a jiffy, allowing you to see out of every window for safer driving. 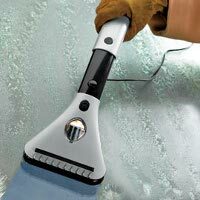 Gone are the days of manual scraping with the $24.95 Electric Windshield De-Icer – just plug it into your car’s cigarette outlet and glide it across the windshield. It comes with a retractable handle and a 14″ cord for extra reach, while an integrated light and squeegee offers a streak-free view. Don’t you mean 14 foot cord ? 14″ wouldn’t even reach all of the inside of the windows !